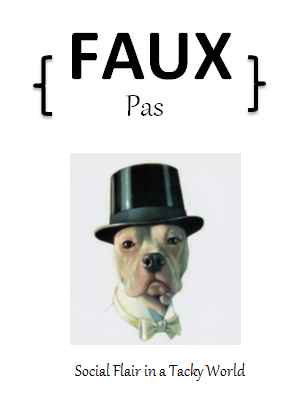 faux pas [foh pah] noun, plural faux pas [foh pahz; Fr. foh pah] a slip or blunder in etiquette, manners, or conduct; an embarrassing social blunder or indiscretion. There are as many words for a social blunder as social blunders. My personal favorite (aside from Faux Pas) is peccadillo; a very minor or slight sin or offense; a trifling fault. The word is just flat-out fun to say. Not only are there a zillion words for etiquette, there are a zillion more possible subjects just waiting for juicy comment. BUT… comments are not enough. As cathartic as it might be to vent, what is really needed are solutions to idiotic behaviors. While many idiotic behaviors can be attributed to innocent ignorance, some of them can be credited to outright rudeness caused by selfishness. Polite behaviors are cool. They have not gone out of style but only faded from the forefront of our current culture. Every day one can witness countless examples of bad form. While these may elicit a shake of the head or roll of the eyes, it’s the good examples that stick out. It’s the five- year old child who shakes your hand upon meeting and says thank you for the fudgsicle. It’s the teenage boy-man who gives up his seat on the L for a woman. It’s the dinner guest who politely eats the lutefisk dinner lovingly prepared by his friend. And who doesn’t hate lutefisk!? All of these examples will undoubtedly provoke a smile. That’s what good manners do. Good etiquette means thinking of others before yourself. Where have we heard that commandment before? Amy Vanderbilt and the Post women may have started the modern etiquette revolution but let’s not forget that God himself charged us with this challenge. Yep, I’m a believer. Whoops…I meant “yes”. Proper etiquette crosses all belief systems, cultures, races and genders. It is universally beneficial to and for EVERYONE. Of course with any battle, it must be said that the crusader will need gracious accommodation. While I would love to say that I never, ever, ever commit any trifling fault, claiming that would be an outright lie; therefore a blunder. It’s time to dive in. I’m thrilled! You made my day. Thank you for the lovely comment!